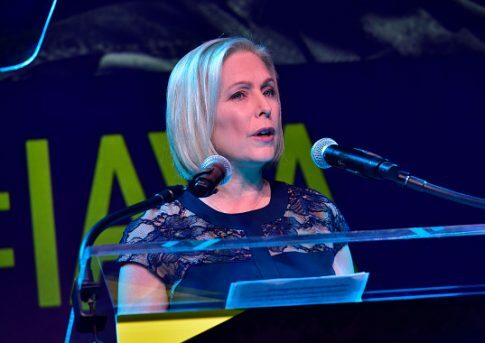 A major newspaper in western New York slammed Sen. Kirsten Gillibrand (D., N.Y.) on Thursday for saying unequivocally during her 2018 Senate campaign that she would serve her full six-year term in the Senate. The Buffalo News editorial board wrote it understands politicians want to make their presidential announcements on their own schedule and will dance around questions about their ambitions, but the board said, "they don’t flat-out lie." Gillibrand announced the formation of a presidential exploratory committee on Tuesday, saying she was "going to run for president of the United States, because as a young mom, I'm going to fight for other people's kids as hard as I would fight for my own." But in 2018, the board noted Gillibrand "bluntly denied" she would run for president. "Sen. Kirsten Gillibrand flat-out lied. As the New York Democrat’s 2018 re-election campaign neared its end, she bluntly denied she would run for president and pledged to serve her full term. It was unnecessary and unfortunate," the editorial reads. The board spells out two exchanges–one during a Oct. 25 debate and the other during a Buffalo News editorial board interview–where Gillibrand was asked about her future ambitions looking forward to 2020. Question: "Can you tell New Yorkers, who plan to vote for you on Nov. 6, that you will, if re-elected, serve out your six-year Senate term?" Question: "Just want to make this clear, you’re saying that you will not get out of the race and you will not run for president? You will serve your six years?" Gillibrand: "I will serve my six-year term." Question: Are you really not running for president? Gillibrand: I’m really running for Senate. Question: But you’re not going to? The board noted Gillibrand can only fulfill her debate promise "if she plans to lose." The board condemned politicians making bold-faced lies the norm in politics. "It’s too bad that she and so many other politicians feel they need to conceal their ambitions from voters. Americans only benefit when able, experienced people of either party want to serve the nation. But such is politics," it wrote. "We know that lying is endemic in Washington, especially these days and especially by President Trump, who seems to revel in it. But that can’t become the standard," the board added.